National Post. Donner, Harrison & Hober: Let’s talk about climate change. Kinder Morgan’s Transmountain Pipeline alone is expected to lead to 50% more carbon dioxide (CO2) emissions each year than all of British Columbia currently produces. That fact prompted 26 university professors who study climate change to apply to lend their expertise to the NEB’s assessment of whether this project is in the public interest. Every one of them was rejected, because we proposed to talk about climate change. “The human psyche isn’t well-equipped, some researchers argue, to conceptualize and digest the catastrophic changes on the horizon.” Visualizing Climate Change goes a great length helping its audience understand how our future can look like if we adapt to climate change, and if we don’t. How to drive home the impacts of a warming province? Stephen Sheppard and his UBC team offer a glimpse. Landscape Architecture Magazine. See the Change. A Canadian Researcher helps communities foretell what climate change will look like. A UBC professor wants to get more students interested in climate change by having them create a video game that focuses on how Delta, B.C., could be destroyed by or saved from flooding. Sensors & Systems.Collaborative Visualization to Advance Landscape Planning. On the CIRs Decision Theatre, CALP, and Visualizing Climate Change. ICLEI Europe. Book of the Month. 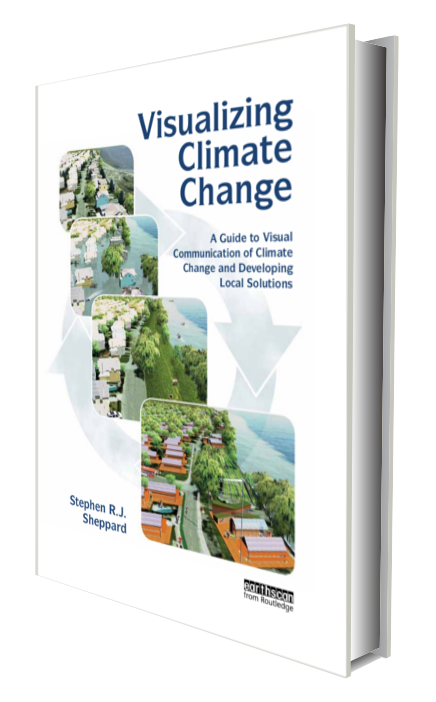 By emphasizing the principle of “knowing, seeing and acting” the book seeks to deliver the message that only with the right language – using narrative story telling based in reality – will we be successful in engaging our communities around the world to act on climate change. Visualizing Climate Change on UBC’s School of Architecture and Landscape Architecture compendium of Faculty Work. Stephen Sheppard’s work selected as one of the most relevant works being developed amongst SALA’s Faculty. When it comes to climate change, UBC Prof. Stephen Sheppard and Research Scientist David Flanders know that pictures speak louder than words.